These bright flower hair ties are great for little girls! 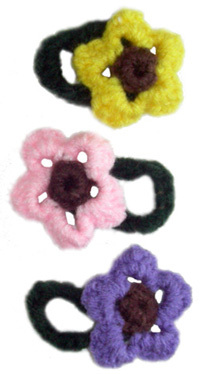 Use your scrap yarn to make these precious flowers and attach them to a nicely covered rubber band. They look great bouncing around on a child’s head and won’t pull hair like plain rubber bands do. Just grab a rubber band and some yarn and start crocheting. Using photo as a guide, sew flower onto hair tie with a yarn needle. Need help with this pattern? Just leave a comment! This entry was posted on Sunday, February 15th, 2009 at 3:42 PM by Rachel Choi	and is filed under Free Crochet Patterns. You can follow any responses to this entry through the RSS 2.0 feed. You can leave a response, or trackback from your own site. I just found your site today and I love it and want to encourage you to keep up the good work. I’ve been crocheting for over 20 years but still enjoy small, simple projects. I am going to make some of these floral ponytail holders for my daughter this evening. Thanks Jenny for the great feedback! Let me know how your ponytail holders come along! I loved your pattern for the little ponytail holders. My sister is going on a mission trip in Peru this December, and I am going to make as many as I can so she can give them to the little girls there. Thank you for sharing your pattern, and may God bless you. Hi Rachel,you more or less save my cochet life on how to crochet rose. thank you so much and keep up with your good, great creative work. Trixie, to make a single crochet around your rubber band, insert your hook into the rubber band to make your single crochets. Keep making single crochets until it covers the entire rubber band. You may have to move the single crochets with your hand if you see some gaps. I LOVE THESE, they are sooo cute!!! 😀 I made one for my sister, and she loves it too. Thank you for all crocheting genius! T he pattern for flower hair tie scrunchie is GREAT! I use the pony holders instead. I found these are easier to work wiht .Hope this helps someone. I am trying to crochet your flowers, but it seems to not be working. I only geyt 4 petals and not 5 like you. On round one after you do 10 sc in loop do you join to the first sc and then change colors? Hi Amber, no need to join after the round, you can keep crochet in the round, sort of like a spiral. There are 10 sc in round 1, so when you go to round 2, when you do the “ch 4, skip 1, sl st in next sc” you are using 2 stitches (one you skip and one you sl st into) for each petal. That way you will have a total of 5 petals (10/2 = 5). I just got done making one of these a bit ago for my daughter and she absolutely adores it. 🙂 Now she wants more in different colours! Time to get busy, thanks for the pattern! Floweres are pretty, been crocheting them, but have trouble sewing on, can you give me some onfo on how easy it is! Hi Sher, try using the same color as your yarn on the band. You can weave it back and forth on the back side of the flower to attached it. Rachel, I’ve tried again and I can not get it to like the pic….do you have a written out pattern…or can I buy one fron you to see it??? Desperate the girls want these and I can not figure out the band….Help please!!!! The complete pattern is written above. After you do the single crochets around the rubber band, try and use the same color yarn to attach the flower to it. There’s no exactly right or wrong way to do it, but I just weave the needle back and forth through the back side of the flower. If it’s too hard for you to attach it, you can also try just gluing it on. I need to know how to print these patterns. I don’t see a place to print them. Hi Arlene, you can use the print function in your internet browser. Go to “File”, then “Print”, (steps may vary depending on what browser you’re using). Each page on Crochet Spot is coded to be printer friendly, so when you print it out with your internet browser I’ll be nice and neat. Let me know if you need more help printing. Hi Jadyn, try clicking on the link right before the pattern that will take you to the abbreviations page. There you can see what each abbreviation stands for. hello! For the hair tie, you are going to make single crochets by inserting your hook into the center of the rubber band (instead of inserting your hook into a crochet stitch, like you normally would do). This way, the single crochet stitches will end up covering the entire rubber band. You’ll make the single crochet stitches the same way you normally would, the only difference is that you’re inserting your hook into the rubber band to begin each stitch. I just made one of these, but compared to your flower, my flower is flat. Yours looks “poofy”. Hi Stacy, the flower is suppose to be flat. It might just be the way I took the picture that makes them look poofy. Hi,I only started learning crocheting yesterday,I have always wanted to make a flower. Your flowers are so pretty,thank you for helping people like me. Great job! Hello Rachel: You are so very kind to share all your fantastic patterns with us ….. do you at least get something out of this? What I mean is, I hope you do somehow, somewhere get some profit from this as you cannot live on air alone …. perhaps you have sponsors? Perhaps you may think this is none of my beeswax and am nosy, I do not mean to be such but since you are sssooo generous in sharing all these beautiful patterns, you deserve for sure to get something back, as you are not charging for your patterns.